Established for over 25 years we offer a full range of medical and surgical services for dogs and cats in a clean, modern, and professional environment. We service the Ascot, Clayfield, Hendra, Teneriffe, New Farm, Hamilton and surrounding suburbs. We are located at 223 Lancaster Rd, Ascot, just twenty metres from the corner of Racecourse Rd. Scott is one of the owners of Ascot Veterinary Surgery, and has operated the surgery for over 25 years. Graduating in 1984 from the University of Queensland with a Bachelor of Veterinary Science, Scott has always been involved in Small Animal medicine and surgery with a particular interest in Canine medicine and reproduction. He bred and exhibited Cavalier King Charles Spaniels for 20 years and was the inaugural president of the Cavalier King Charles Spaniel Club of Qld and Veterinarian for the Canine Control Council of Qld. Apart from Cavaliers, he has bred Cocker Spaniels, owned a Labrador and currently has a poodle. Scott is an AQIS (Australian Quarantine) accredited Veterinarian and is involved in preparing dogs and cats for export overseas, allowing them to accompany their owners almost anywhere in the world. Scott regularly attends continuing education conferences and has recently returned from the World Small Animal Veterinary Conference in Geneve. Ben is one of the partners of Ascot Veterinary Surgery. Graduating from the University of Queensland with a Bachelor of Veterinary Science in 1998, Ben initially began working in a mixed animal practice at Laidley, before moving to a large small animal hospital on the Southside of Brisbane for several years. Six months in the UK saw the cold get the better of him before he returned to Australia to take up a position at the Ascot Veterinary Surgery. In 2005, Ben completed his membership to the Australian College of Veterinary Surgeons focusing on internal medicine in dogs and cats. Following this he completed the Accreditation Program for Australian Veterinarians and then the Australian Quarantine small animal export and accreditation program. Ben is a former President of the Brisbane Veterinary Practitioners Group and Chartered Member of the Australian Veterinary Association. This year we have welcomed Nicole to our team at Ascot Veterinary Surgery. After graduation from St Rita's College, Nicole accepted a position to study at University of Queensland into a Bachelor of Applied Science majoring in animal behaviour/ welfare control and wildlife biology. 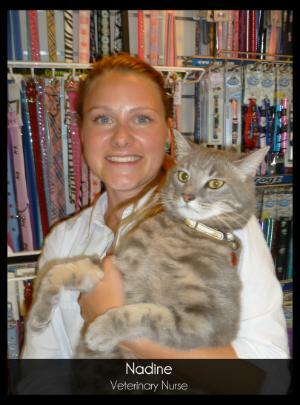 After completing her studies she returned to Brisbane and accepted a position at Greencross Capalaba Veterinary Hospital. Nicole brings a wealth of animal behaviour experience to the practice and is currently completing her Certificate IV in Veterinary Nursing.